Our little urban jungle island is getting yet another tiki bar just in time for Friday’s 80-degree weather. Manhattan is officially saying “Aloha” to the the Polynesian opening tonight from the major players behind the Major Food Group (The Grill, The Pool, Carbone, Sadelle’s, lest you forget). 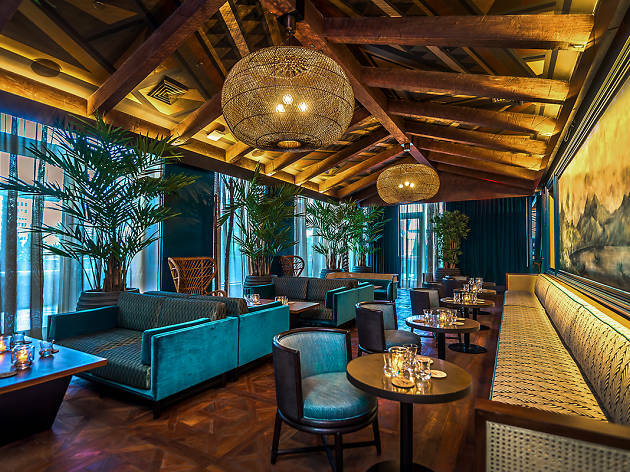 Unlike most tiki bars decked out with sandy floors and straw awnings, the atmosphere at the midtown spot is more subdued and sophisticated, with hanging landscape murals of the 18th-century Polynesia, a turquoise-glazed lava stone bar and carved wood touches. There's also an outdoor terrace with a full-size bar. The summer drinks, however, are a whole different story. The playful large format cocktails come served in fish bowls (with submerged toy fish), a treasure chest and a pirate ship; regular cocktails have flaming croutons (that the bartender lights with his fingers), plastic flamingo garnishes and tiki totem vestibules. Expect lots of rum in those pretty presentations, mixed with ingredients like hawaij spice, cayenne-coconut cream and sarsaparilla. 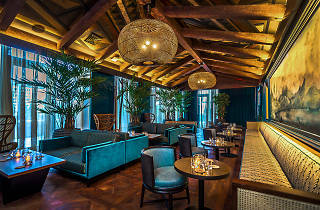 The Polynesian officially opens tonight on the third floor of the Pod Hotel on 42nd St (yes yes, we know). Hey, Times Square is much easier cheaper to get to than Tahiti. See photos of the space and some of the cocktails below.